When it comes to selecting laminate or wood veneers for various projects, project managers, general contractors, and architects should consider the balance between decorative face material and structural integrity. The construction as a whole is referenced to as a panel; the parts include a core covered by a face and a balancing back. To achieve balanced construction, panels must be an odd number of layers (plies) symmetrical from the center line; e.g. inner plies, except the innermost middle ply, should occur in pairs, using materials and adhesives on both sides that contract and expand, or are moisture permeable, at the same rate. Decorative surfacing materials are often applied to wood product cores such as industrial particleboard, MDF and veneer core. Read our previous article if you want more information on panel core materials. Here we’ve listed some of our preferred materials for decorative laminate and wood veneers. Commonly referred to as Plastic Laminate with brand names like Formica and Wilsonart, High Pressure Decorative Laminate (HPDL) is a standalone product that can be laminated onto a core as the face of a sheet product or directly onto a structure as a covering. Decorative laminate is produced in a one-step process by fusing together, under heat and pressure, multiple layers of kraft paper saturated with phenolic resin, together with a layer of melamine-saturated decorative paper. The assembly offers resistance to wear and many common stains and chemicals. 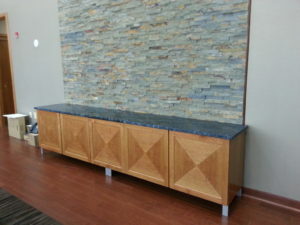 Common uses include casework exteriors, countertops, and wall paneling. Low Pressure Decorative Laminate panels are thermally fused together and pressed from a thermoset polyester or melamine resin impregnated web. Most products are pre-laminated to Industrial Particleboard or Medium Density Fiberboard cores when they arrive at the woodwork fabricator. LPDL performs similarly to High Pressure Decorative Laminate except on the impact test. LPDL is commonly referred to as “melamine” – impregnated papers, the most common, are noted for their hardness, scratch resistance, and color stability. LPDL is a great economical but durable choice for cabinet interiors. Backing materials are essential in the fabrication of decorative laminate clad surfaces to prevent warping and to protect against dimensional instability of both laminate and core in conditions of changing temperatures and humidity. Backing sheets are non-decorative, but both economical and effective in the creation of successful cabinetry. Produced without a decorative face, backing sheet is available as standard (slightly thinner than decorative) or regrind (reclaimed decorative laminate with decorative sheet sanded off). Wood manufacturers produce veneers in a variety of industry standard thicknesses. A number of variables control the slicing process. For a high-quality end product, the raw veneer needs to be thick enough to avoid show-through and sand-through. Particleboard and MDF are the recommended cores for wood veneer and high pressure decorative laminate work because of their excellent flatness. Hardwood veneer is available in many domestic and imported wood species, such as oak, cherry, walnut, or maple. Normally cut as plain sliced, hardwood veneer is available as rift sliced and quarter sliced in certain species, for an additional cost. The individual leaves of veneer can also be arranged in different ways including book matching and slip matching. If you’re interested in professional architectural woodwork, we’d love to complete the construction team for your next project. Contact us if you’d like to discuss feasibility, potential return, and if our services are the best fit for your business.